Demonstrations tied to the April police custody death of Freddie Gray continued on Monday evening, hours after jury selection got underway for the first of six officers slated to stand trial in his death. Carrying signs that read, "Black Lives Matter," and chanting "No justice no peace! No killer police!" several dozen protestors marched through downtown Baltimore, making stops at City Hall, police department headquarters, and several popular tourist spots, including the city's famed Inner Harbor. No arrests were reported. The protests followed day one of the jury selection process in the case of William G. Porter, 26, one of six officers indicted. He faces charges that include with manslaughter, second-degree assault, and reckless endangerment for his alleged role in Gray's demise. The 25-year-old Baltimore man was arrested on April 12 near the Gilmor Homes housing projects on the city's west side. As Gray was loaded into a police van, the interaction was recorded on a cell phone. The footage appeared to show Gray being dragged, as neighbors shouted to police that he seemed to be hurt. He died on April 19, after being in a coma. A coroner's report would later indicate that Gray suffered a spinal cord injury during transport in the police wagon. Hours after Gray's funeral on April 27, this predominately black city of some 650,000 residents erupted in looting, arson, and rioting. Maryland's governor, Larry Hogan, called in the National Guard and Baltimore Mayor Stephanie Rawlings Blake instituted a curfew that lasted several days. State's Attorney Marilyn Mosby brought charges against Porter and the five other officers less than a week after the city's unrest. The officers—three white and three black-- all face various individual charges, including second-degree heart depraved murder. Separate trials are scheduled between now and March 2016. Prosecutors allege that Porter failed to put a seatbelt on Gray (who was in handcuffs and leg shackles) and didn't heed his request for medical assistance. His defense is expected to counter that the officer told his superiors that Gray needed care, but may have been faking. Porter is reportedly a material witness in the coming trials of two comrades—van driver Caesar Goodson, Jr. and Sgt. Alicia White. 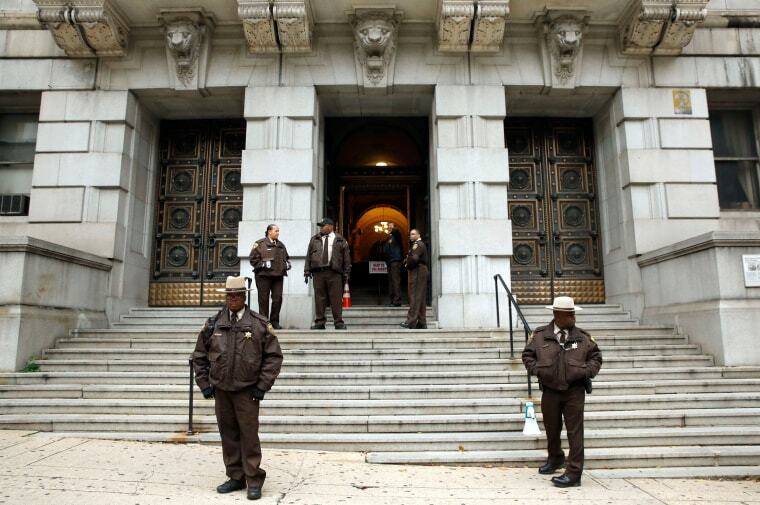 Legal and civic experts believe the Baltimore trials will be closely watched, particularly after other high profile police killings involving unarmed black men in Ferguson, Missouri, New York City, and of late, Chicago. "What happens will have implications that will affect citizens for years to come," said Zainab Chaudry, the Maryland outreach manager for the Council on American Islamic Relations (CAIR), which has been monitoring the case along with other national organizations and grass roots groups. "It's complicated, but we do have to have faith in the justice process. " On Monday, some 75 prospective jurors—a multiracial, multigenerational mix, in which about two-thirds were African American women and men---were vetted by Judge Barry Williams. The panel will include 12 jurors, with a still undetermined number of alternates. Once the final jury is seated, they will not be sequestered in a hotel, but will be anonymous. Porter, wearing a dark suit and yellow tie, sat in front of the potential jurors earlier today, along with his legal team, who took notes. The judge asked questions of prospective jurors that ran the gamut from how many were familiar with the case and the $6.4 million settlement that the Gray family received (all of them indicated they were), to whether anyone had been arrested, a victim of crime and/or had criminal records; a significant number of people responded affirmatively. The courtroom wasn't packed, but along with local and national media, members of the legal and activist communities were in attendance. "We did court-watch today and we’ll be here throughout the process," said Tessa Hill-Aston, president of the Baltimore branch of the NAACP, which has its national headquarters in Baltimore. "We also plan to observe the other [officer] trials, so we can see and hear it for ourselves." The scene inside the courthouse also drew demonstrations that began early this morning. About a dozen or so protestors gathered outside, and their chants reverberated inside the courthouse. They carried signs while shouting "Indict police!" and "We won't stop. We can't stop. Til killer cops are in cell blocks!" "We out here today [because] we want convictions," said Tawanda Jones, who said that her brother, Tyrone West, was killed by police in 2013. "Freddie Gray was brutally murdered. And we expecting the people to do right today. We want convictions." Jones told onlookers, the jury should "take in all the facts. Please don't be biased. ...The facts will be the leading thing in this case." The judge will continue interviewing potential jurors on Tuesday. He said opening arguments would begin mid-week, with the trial expected to last no later than December 17.